The highway between the cities of Irkutsk and Krasnoyarsk passes through rolling hills interspersed with small farming villages. Driving west from Vladivostok, this is where the wildness of the Far East gives way to the heart of Siberia. After stopping to camp on the southern shore of Lake Baikal on your road trip across Russia, plan on spending a few days in the city of Irkutsk. Located on the Angara River just northwest of Lake Baikal, Irkutsk is one of Siberia’s most stunning cities. Originally established as a trading center, Irkutsk was founded over 350 years ago. Today, the wealth that once poured into the city is evident in the many historic wooden houses featuring elaborate woodwork and window trim. Once referred to as the “Paris of Siberia,” Irkutsk has traditionally served as Siberia’s cultural, economic and intellectual capital. Irkutsk has a wealth of museums worth visiting after a long drive through Siberia. Stop by the Regional Art Museum for Russian and East Asian art and the Regional Museum for exhibits on the indigenous peoples of Siberia. To get a better sense of Irkutsk’s history, visit the Museum of the City of Irkutsk. Located in a palatial 19th-century building, it offers an informative look at Irkutsk over the centuries. Don’t leave the city before visiting the Znamensky Monastery or the Bogoyavlensky Cathedral, which were both originally destroyed by fires during Irkutsk’s early days. The monastery, completed in 1772, features a small cemetery where notable locals are buried. 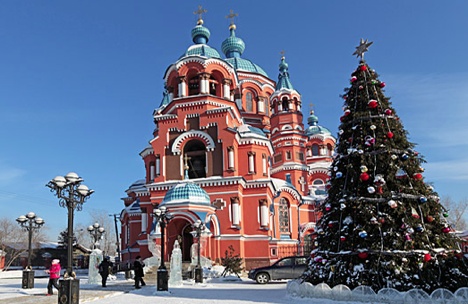 The cathedral features a jumble of onion domes and towers that have long made it one of Siberia’s most iconic buildings. The Hotel Victoria is a good option with rooms starting at $100 a night including breakfast and parking. After exploring the southern coast of Lake Baikal on your drive along the Trans-Siberian Highway, you can visit the lake’s western coast as a day trip from Irkutsk. Hop on a ferry run by the Eastern-Siberian Inland Navigation Company, also known by its Cyrillic acronym, VSRP. The ferry company offers package tours and ferry service to numerous towns on Lake Baikal. If you just want to get out on the water for a few hours, VSRP runs a historic tour along the Angara River (about $10, 1 hour) that includes an audio guide. You can also book a tour to beautiful Peschanaya Bay (about $50, 10 hours, Fridays and Sundays only), or the quaint lakeside village of Bolshie Koty (about $26, 4-10 hours depending on the boat). You can also buy a ferry ticket at VSRP to many Baikal towns. Bolshie Koty (about $13, 1.5 hours from Irkutsk) is one of the most tranquil locations on the lake. Ferries run to the village three times a day from Irkutsk except for Mondays and select weekdays during the summer. Check the ferry schedule before planning your trip. To get back on the road from Hotel Victoria, drive south on ul. Karla Marksa and take a right on ul. Lenina. Turn left on ul. Chkalova and bear right toward the Angarsky Bridge. On the other side of the bridge, get on the M-55 Federal Highway. Outside Irkutsk the route number on the Trans-Siberian Highway changes to M-53, which will take you to the city of Krasnoyarsk (14 hours, 1,000 kilometers). The long drive to Krasnoyarsk consists of tall hills and farmland. Like the drive through the Russian Far East, you can park your car by the road and camp, although it’s best to ask for permission if you see a house nearby. Siberia is a land of rivers, and the city of Bratsk (9 hours, 600 kilometers north of Irkutsk) is home to the Bratsk Dam, once the world’s largest hydroelectric power station. The Bratsk Dam can be visited independently, but you’ll see far more with a tour. Contact Taiga Tours in Bratsk to arrange a visit to the Bratsk Dam. During summer different varieties of wildflowers grow on the M-53. The flowers overtake entire fields that appear in the distance like purple or yellow lakes. Locals often pull over to pick wild berries and mushrooms, or appear in the meadows leading flocks of sheep to graze in the countryside. This is a great area to witness the pastoral life described in classic Russian novels; you’ll find that rural traditions are alive and well in the villages on the road to Krasnoyarsk. Upon reaching Krasnoyarsk, you can drive south away from the Trans-Siberian Highway into the Tuva Republic, home to the Tuva people , practicing Buddhists who trace their ethnic and cultural roots to the Turkic and Mongolian peoples. Most famous for their throat singers, Tuva can be a fascinating, albeit long, side trip that is recommended if you have time. To reach the Tuva Republic, take the M-54 south out of Krasnoyarsk to the city of Kyzyl (10.5 hours, 800 kilometers). Because most of the Tuva Republic is so close to the Mongolian border, special permits are necessary to travel freely in the region. We recommend arranging a tour to the Tuva Republic in advance. The travel agency Sayan Ring in Krasnoyarsk offers a number of day tours ($60-300 depending on tour and duration) in and around Kyzyl that will help you explore the region’s unique culture and meet some of the locals.